Everyone drinks. But not everyone is capable of knowing what is it in their drink that makes them engulf it with delight. Some people drink coffee because it jolts their senses wide awake. Some people drink tea because it soothes them. Some people drink juice to be refreshed. Some people drink spirited drinks for various reasons left alone to the individual. Everyone drinks water not out of whim, but because it is a universal solvent and everyone has to. No questions asked. Just as babies drink milk because it’s the only thing that’s going to make them bigger and stronger. But what is it with drinking, and more so, how do we enjoy them accordingly? Thank heavens for the invention of shape-shifter containers that gives our drink its distinct shape and personality. Milks and juices are placed in kiddie-sized cartons for the little tykes to enjoy. Coffees are placed in disposable Styrofoam cups or cans, and for the more sophisticated coffee drinker who can’t get enough of their frappuccino, in disposable plastic cups with open top container; while some of the spirited drinks are placed in cans for the to-go, easy-to-consume drinks, and the more sophisticated spirited drinks, in aesthetically designed glass containers. Shape-shifter containers as status symbol? Perhaps. Art of drinking? Probably. 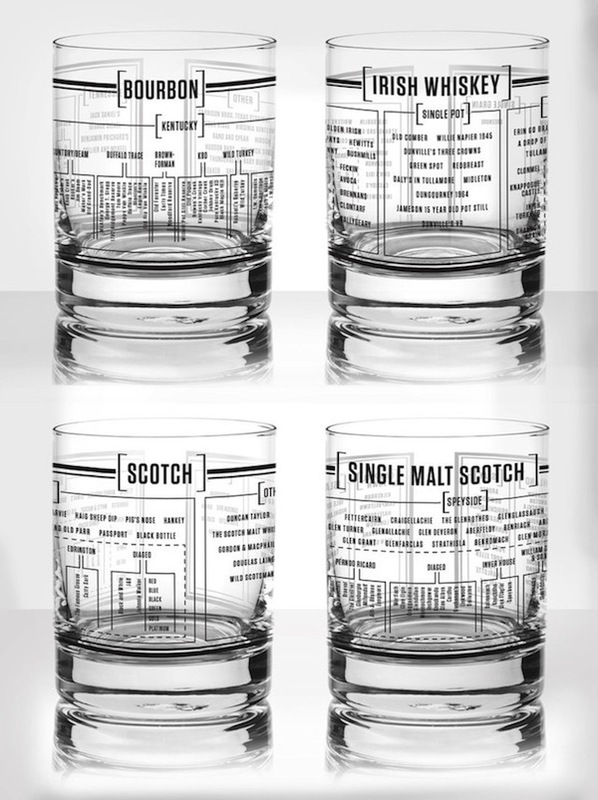 Today’s feature includes one of the most detail-oriented art-laded design glass masterpieces from Pop Chart Lab, who showed the many varieties of one of the age-old favorite spirited drinks: whiskey. Each glass is laded with information on the many varieties of the drink, making it one of the must-have displays in the shelf, along with other wines, liquors, and beers. You have to admit these glasses are pure genius! Information within your grip, coupled with a svelte drink, makes one an instant whiskey connoisseur (even if you’re not). A look at the intricate details of the design and you’ll know it is going to be a wonder among drinking peers. The overall design gives off a smooth and suave feel. Art is pretty much everywhere. It gives people an alternative to a monotonous take in pretty much everything. And in drinking, it makes you gobble things down with much gusto, but with style and manner.